Joko Said was born around 1450 AD His father was Wilatikta Arya, Duke of Tuban. Arya Wilatikta are descendants of the legendary rebel Majapahit, Ronggolawe. Illustrious history Wilatikta Arya said that the Duke had embraced Islam since before the birth of Johnny Said. But as a Muslim, he was known for ruthless and very dogmatic to the Majapahit central government adheres to Hinduism. He set a high tax to the people. Said Ricardo young who do not agree on any policy of his father as Duke often defiant in his father's policies. Said his father Joko insubordination culminated when he dismantle the barn duchy and handed out rice from the barn to the people of Tuban who was in a state of starvation due to drought. Because of his actions, his father then 'hold court' to try Ricardo Said and ask the reason for his actions. The opportunity was not wasted by Joko Said to tell his father that, for reasons of religion, he was strongly opposed to his policy of piling up food in a barn while his people live in poverty and hunger. His father can not accept this reason because they think Joko Said to mengguruinya in religious matters. Because of that, his father and then throw him out of the duchy court saying that he'd be back if it is able to vibrate the whole Tuban by reading verses of the Qur'an. The purpose of the 'thrill the whole Tuban' here is where it already has many well-known science of religion and society because of their knowledge. Illustrious history and then told that after being driven from the duchy court, Joko Said robber turned into a well-known and feared in the region of East Java. As a Marauder, Joko Said always 'choose' their victims carefully. He just rob the rich who do not want to spend zakat and sadaqah. From the results rampokannya it, most of it is always he was distributing to the poor. This story is probably similar to the story of Robin Hood in England. But that's about his famous history. This is expected as a robber, he was given the title 'Lokajaya' means roughly 'Marauder Budiman'. Everything changed when Lokajaya aka Johnny Said met with a cleric, Maulana Sheikh Ibrahim alias Makhdum Sunan Bonang. Sunan Bonang was later mernyadarkannya that good works can not start with the bad-haq something that can not be confused with something that Johnny Said vanity-alias Lokajaya repent and cease to be robbers. Said Ricardo later studied the Sunan Bonang until it finally became known as the cleric with the title 'Sunan Kalijaga'. This question is still a mystery and material disagreement between the experts of history until today. Cirebon community believes that the name comes from the hamlet Kalijaga in Cirebon. Sunan Kalijaga had ever lived in Cirebon and close friends with Sunan Gunung Jati. This is connected with the habits wong Cerbon to menggelari someone with the region of origin, such as Sunan Gunung Jati degree to Sheikh Sharif Hidayatullah, because he lived at the foot of Gunung Jati. The evidence suggests that there was no 'time' around the village Kalijaga as typical village. In fact, the places in Java are generally named with something that characterizes the place. For example, a name that caused many rebon Cirebon (shrimp), or the name of Pekalongan because of the large fruit bats (bats). Logically, the name 'Hamlet Kalijaga' it would appear after the Sunan Kalijaga own lives in the village. Therefore, the Society claims it is less acceptable Cirebon. Another comes from the history of Javanese mysticism (Javanese). They associate this name with joy trustee is bathing in the river (times) so it looks like someone who is "guard time". Other Javanese history of this name appears as Ricardo Said once told meditated on the banks of the Sunan Bonang times over the past ten years. This last opinion is the most popular. This opinion even raised in the film 'Sunan Kalijaga' and 'Walisongo' in the 80s. I own a second or less agree with this opinion. In syntax, the grammar of languages ​​in Java (Sundanese and Javanese) and all the dialects, if there is a noun phrase is placed in front of a verb, it means that the noun is a subject that serves as the perpetrator of the verb that follows it. So if there is the phrase 'duty time' or 'time Jogo' means there is 'a time to keep things'. This is very strange and unreasonable. If it is true that the name is derived from the habits of the Sunan kungkum in time or because he had to keep a time for ten years non-stop (like in the movie), then it should be called is "Sunan Kali Jogo" or "Keep Sunan Kali". Logically then, please think carefully. Could it be a preacher to spend time with kungkum-kungkum in the river all day? Of course not. As a preacher who loves Islam and its syi'ar, of course there are many useful things he can do. Javanese history that he be imprisoned for ten years non-stop at the edge of time is also a history that does not make sense. How can a pious cleric imprisoned without constantly praying, fasting, even without food and drink? Therefore, in my opinion, it is both a history and a history of vanity can not be justified scientifically. The most reasonable opinion is that the actual name of 'Kalijaga' comes from the Arabic "Qadli 'and its own original name,' Joko Said ', so the original phrase was' Qadli Joko Said' (That Judge Ricardo Said). 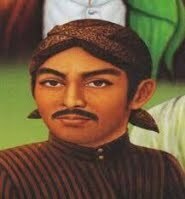 History records that when the Territory (the Trust) was established in 1478 Demak, he was assigned as Qadli (judge) in Demak by Wali Demak time, Sunan Giri. Java community has a strong history in terms of 'irregularities' pronunciation of Arabic words, for example, the term Sekaten (from' Syahadatain '), Kalimosodo (from' sentence Shahadah '), Mulud (of Mawlid), Suro (from Shura'), Dulkangidah ( of Dzulqaidah), and many other terms. So no wonder that the phrase "Qadli Joko" then compromised into "Kalijogo 'or' Kalijaga '. Qadli position is held by Kalijaga aka george Said Demak is evidence that a government that runs the Islamic Sharia. This is reinforced by the position as mayor in Sunan Giri Demak. The term 'Qadli' and 'Guardian' is a title in the names of the Islamic State. From here sajasudah unclear who actually Kalijaga Sunan; he adalahseorang Qadli instead Kejawenisme practitioners. We return to the Sunan Kalijaga Sunan Qadli alias Joko. History tells us that the life of famous Sunan Kalijaga estimated at more than 100 years. This means that he has the final power of Majapahit in 1478, the Sultanate of Demak, Cirebon Sultanate, the Sultanate of Banten, even to the kingdom Display (born 1546) and the beginning of the kingdom of Mataram. If history is correct, then the Sunan Kalijaga life is a life long period. Manuscripts and old chronicle, the chronicle was just mentioning his name until the time of the Sultanate of Cirebon course, that is up to when he lived in the hamlet Kalijaga. In the stories of the establishment of the Kingdom Display by Jake Tingkir and the Kingdom of Mataram by Panembahan Senopati, his name no longer mentioned. The logic is that, when he was still alive, would he be involved in the question of Imamat in Java because of its influence is widespread in the Java community. The evidence suggests that the tomb was in Kadilangu, near Demak, not on the Display or on the Mataram (Yogyakarta and surrounding areas)-the places where Kejawen flourish. In my estimation, he is dead now Demak still standing. Vanity narrations many strange stories told about the Sunan Kalijaga-story addition to the ten-year hermitage on the banks of the river. Some strange stories, among others, that he can fly, can reduce the pounding feet of rain, lightning lock named Ki Ageng Selo in the mosque Demak and other stories of when we think of non-intellect with common sense could not enter the brain humans. Strange stories of that kind can only be believed by a lunatic who likes magic. Sunan Kalijaga impressed syncretic teachings and smells as well as Javanese Hindu-Buddhist. Though the facts of life are the Sunan Kalijaga Islamic Da'wah and syi'ar beautiful. The proof is very much at all. Sunan Kalijaga is the designer and the construction of the Great Mosque Great Mosque of Demak Cirebon. Pole "chips" (wood fragments), which is one of the main pillars of the mosque is a relic Sunan Kalijaga creations. How could a Javanese mystic, wants will set up a mosque that was clearly a place of worship of Islam. Sunan Kalijaga religious thought is not sufi-salafi-pantheistic Javanese-style air-the motto 'Gusti Manunggaling subjects'. This is evident from his firm stance that participate in Sunan Giri line when there is a dispute in the matter of 'infidelity' Sheikh Siti Jenar with his teaching that man and God are united in the same Essence. Arts and culture is the means chosen Sunan Kalijaga in preaching. He was very tolerant of the local culture. But he also had a firm stance on the issue creed. During the culture still be transitive and not contrary to Islamic teachings, he accepted it. Beber ancient Javanese style puppets that portray the human image in detail dirubahnya become a faint shadow puppets and not too similar to the image of man, his knowledge that the drawing and the image is something like a human in Islam is prohibited. Evolving story relates that he often traveled out of the village just to hold a puppet show with his own as the mastermind. All who watch the show held wayangnya not paid, only asked two sentences say the shahada. He argues that society must be approached gradually. First berislam used to further develop the creed aspects of worship and Islamic knowledge. Sunan Kalijaga believes that if Islam is understood, by their old habits disappear. Play-play that brought the show-Sunan Kalijaga pagelarannya not play-play kind of Hindu Mahabharata, Ramayana, and others. Although the figures he used the same (the Pandavas, Kauravas, etc..) He composed his own play-lakonnya, such as Layang Kalimasada, the play Petruk So the King who all have a strong spirit of Islam. The characters were puppets who brought him added to the new characters that have the breath of Islam. For example, the characters comprising Punakawan Semar, Bagong, Petruk, and Gareng characters are loaded with Islamic content. 2. Characters 'Semar' is taken from the Arabic, 'Simaar' which means nail. In this case, a Muslim has a solid stance and faith like a nail stuck, Simaaruddunyaa. 3. Characters 'Petruk' is taken from the Arabic, 'Fat-ruuk' which means 'tingggalkan'. That is, a person who leaves all worship to other than Allah, Fatruuk-kuluu siwallaahi man. 4. Characters 'Gareng' is taken from the Arabic, 'Qariin' which means 'friend'. That is, a Muslim is always trying to find as many friends to be invited to the goodness, Nalaa Qaarin. 5. Characters 'Bagong' is taken from the Arabic, 'Baghaa' which means 'rebel'. That is, a Muslim has always rebelled at the sight of injustice. Sculpture, puppets, gamelan, clothes piety, celebration sekatenan, Grebeg Maulud, and the mysticism of sound art that creates a mere propaganda tool, not a culture that needs ditradisikan to rust in the heart and is rated as mahdhah worship. He looked at it as merely a method, the method is very effective propaganda of his day. Philosophically, this is the same as proselytizing the Prophet Muhammad who rely on the beauty of the verse of the Qur'an as an effective method of proselytizing in conquering the hearts of the Arab tribes, who liked to declaim. It is undeniable that the habit and out of villages and providing free entertainment to the people, through a variety of performing arts, also has the same philosophy with the usual activities of the Caliph Omar ibn Khattab ra who love and out of the village to monitor the people and provide live entertainment to the people who need them. This equation strengthens the evidence that Sunan Kalijaga is the leader of the character, traits, and leadership qualities commonly possessed a true Islamic leaders, not a Javanese.